Do you know anyone getting married? Newly engaged? Love to give back to charities? Heck... maybe their 2nd wedding! I'm married and this awesome opportunity has ME wanting to do it again! Omni Hotel at Independence Park is auctioning off a $50,000 wedding to benefit Alex's Lemonade Stand Foundation and the fight against childhood cancer! Alex's Lemonade was started here in the Philadelphia region and their story is just gorgeous. It's so amazing how one little girl changed the country and the awareness of childhood cancers. PHILADELPHIA, PA – The Omni Hotel at Independence Park is donating a big girl’s dream to make a little girl’s dream come true. The hotel, together with a group of select vendors across the city, is auctioning a complete wedding package worth more than $50,000 to benefit Alex’s Lemonade Stand Foundation in its battle to cure childhood cancer. The auction – entitled aweddingforalex.com - will begin June 9, 2012 8p.m. on eBay. The minimum opening bid will be $10,000. Final bids coincide one week later on June 15, 2012 at 8p.m. A preview of this spectacular package is at www.aweddingforalex.com as of June 2, 2012. The package includes an exquisite ceremony and reception for up to 140 people and an all-inclusive resort honeymoon in Mexico, photography, flowers, hair and make-up for the bride and her party, a wedding cake, wedding bands a penthouse suite – the works. Put simply, it is the best of Philadelphia coming together to benefit a truly magnificent cause. Alex’s Lemonade Stand Foundation is named for Alexandra Scott, a little girl with cancer who, at the age of four, set up a lemonade stand in her front yard as a way of helping raise money to cure childhood cancer. Alex passed away in 2004, when she was only eight years old – but not before raising more than a million dollars for her cause. The Foundation that bears her name continues. It has raised millions of dollars and funded more pediatric cancer research projects nationwide. The Omni Hotel at Independence Park is located at 4th and Chestnut streets in the city’s historic Old City section. The wedding ceremony and reception will be held at the hotel’s acclaimed Azalea restaurant and includes everything from filet mignon to a premium open bar. The hotel recently underwent a spectacular, $4 million renovation. The couple will spend their wedding night in the Omni’s penthouse suite with its magnificent living room, luxurious marble baths and commanding view of the city. The lucky couple will begin with a rehearsal dinner at the lovely Union Trust Steak House with 30 of their family and friends. They will then host their wedding August 17, 2013 at the Omni Hotel at Independence Park. Carl Alan Floral Design has donated 20 centerpieces for the reception. Hair and make-up services are being provided by Marc Voci Salon and Color Bar, Delaware County's premiere salon for chic and progressive hair. Hair and make-up services will be completed in the Omni’s penthouse suite. The groom’s tuxedo will be provided by Beau & Co., a British influenced custom clothing company that was created to spread an infectious passion for unique, custom-tailored garments. The groom will received a made-to-measure, full-canvas, custom suit or tuxedo, along with a bespoke dress shirt, more than 40 individual measurements of the groom will be taken to get the perfect fit and there are hundreds of fabrics and many individual style options for the groom to select from, to create something truly unique for the wedding. It is also an opportunity to add a number of custom details to celebrate the big day, such as a monogram of the wedding date on the shirt sleeve or inside of the jacket. Barsky Diamonds, on Philadelphia’s famous Jewelers Row, is donating the wedding bands. And the bride can custom design her cake with the help of the experts at the Classic Cake Company. Sparks Photography, who has photographed some of the city’s most notable society weddings and events, will be taking pictures. DJ Services will be provided by Synergetic Sounds & Lighting. When it’s all over, the couple will fly round trip and enjoy their honeymoon at the all-inclusive Dreams Tulum resort on Mexico’s stunning Riviera Maya. Omni Hotel and Resort Cancun Mexico. The resort is home to world-class restaurants, splendid white sand beaches and an atmosphere of relaxed perfection. Staff will even deliver dinner and drinks to their private balcony – anytime of the day or night. Complete information on every part of the wedding package can be found at the auction’s official web site - aweddingforalex.com. Alex's Lemonade Stand Foundation (ALSF) emerged from the front yard lemonade stand of cancer patient Alexandra “Alex” Scott (1996-2004). In 2000, 4-year-old Alex announced that she wanted to hold a lemonade stand to raise money to help find a cure for all children with cancer. Since Alex held that first stand, the Foundation bearing her name has evolved into a national fundraising movement, complete with thousands of supporters across the country carrying on her legacy of hope. 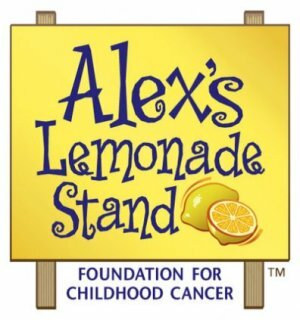 To date, Alex’s Lemonade Stand Foundation, a registered 501(c)3 charity, has raised more than $50 million toward fulfilling Alex’s dream of finding a cure, funding over 200 pediatric cancer research projects nationally. For more information on Alex’s Lemonade Stand Foundation, visit www.AlexsLemonade.org.